Cut the Williams pears into 4 quarters. Wrap each piece of pear in a slice of cured ham. Cut half of the cheese into small cubes and half into 8 quarters. Drizzle the hazelnut oil all over the ham-wrapped pears and pan-roast (cooking time depends on how ripe they are), then keep warm. Put the juice from the cooked pears into a saucepan and combine with the Fendant wine. Add the cheese cubes and the cream, beating until smooth. Sprinkle with some of the parsley, season with salt and ground pepper and taste. Divide the mesclun among four plates. 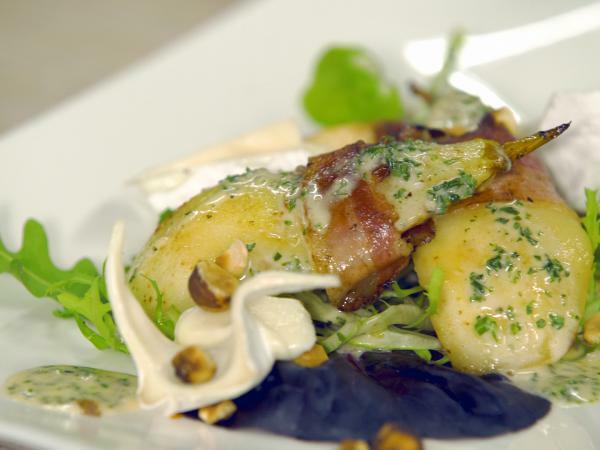 Place the roasted Williams pears and the quarters of goat’s cheese on the salad leaves. Garnish with the hazelnut pieces. Spoon the warm sauce over the top of each arranged plate.